Barcelona Photoblog: Keep on Turning Oh My Rusty, Rusty Wheel! Barcelona images: Daily photographs of Barcelona, Spain. Pictures of a modern city, combined with personal style. A photography and travel site. Art, architecture, people and traditions. Travel to Barcelona through my camera, know more about our city and towns nearby. Welcome! Keep on Turning Oh My Rusty, Rusty Wheel! Don't worry, it ain't no song or poem. 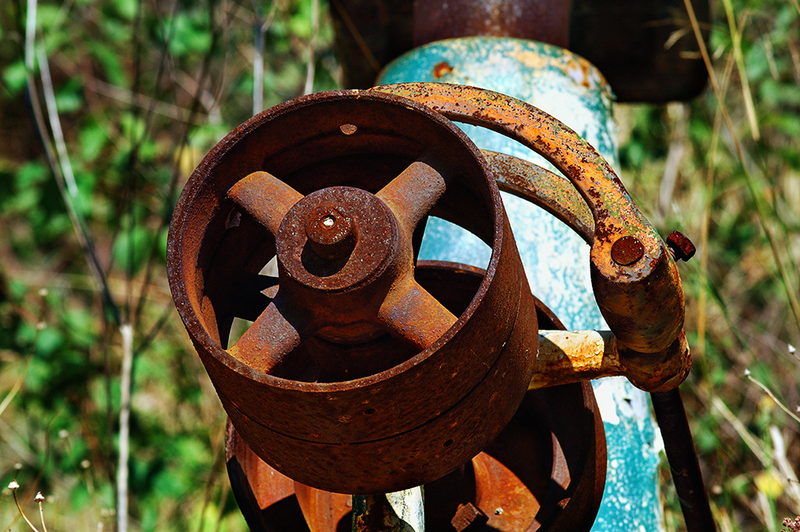 Did I tell you I love rust and decay...in photography!!! Not that I have many pictures like this. Well I remember an old propeller. When you search for stuff carrying a good coat of rust you may come across the wildest remnants of old machinery, tools or scrap metal. Sometimes you may need to visit some abandoned warehouse or a junkyard in the outskirts but this curious wheel part of what I suppose was some kind of winch to load carts I found in a town near Barcelona. Marvellous image really eye catchng colour. I am a "rust lover" too :-)) ... not in real but I love that color and that contrast with turquoise is just great. I just read about the weather in your part of the country. Hope you guys are doing okay. Dunno if I can help with anything at this distance, but if so, be sure to ask. I love that you have the blue in there too. Beautiful photograph. Dsole gracias a tí por venir. Tus visitas me alegran el día. Thanks for offering your help Quantumfog. We personally were not affected. In fact the city of Barcelona is not devastated or anything of the sort but many small accidents did happen, like walls falling, broken windows, live wires on the roads, car accidents. If you stayed at home everything looked quite normal except for the unusual gust of winds more like a tropical storm than the normal winter winds on this part of the world. I have seen hurricanes while on a trip so this was not the same. It is the lack of preparation for these events what causes a bigger disaster. Everything is under control. There were some victims though and that is the saddest part. World climate is changing and we have to be prepared. Thanks for your kind offering my friend. I love the different vivid colors ! Rust and old aged wood are my favorites when it comes to showing Texture. It says so much...You've done a great job with this Photoraph. World’s Tallest Building in Dubai - Burj Khalifa!